I know the folks in the east and the mid-west must think we’re a little nuts out here in the west because everything seems to stop over anything more than a couple inches of snow, but it’s just so rare for us. Last week we got several inches on Monday and had a snow day. Then it started in again on Friday afternoon and by Saturday morning I had 7 inches at my house. We’re supposed to get a little more Sunday night into Monday morning and then another big one starting Monday night. The real problem around here is that it’s hilly and we just don’t have the equipment to keep anything but the major roads clear. When there’s a hard freeze every night the roads get so icy. I’m hoping my school district doesn’t panic this week, and we do some late starts instead of canceling because I really don’t want to be going to school ALL summer! I tend to really like coming-of-age stories, but hadn’t read one in a really long time. 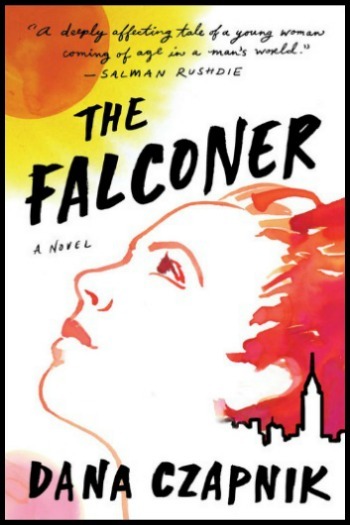 The Falconer by Dana Czapnik reminded me why I like them so much. This little novel had so much going for it. Set in 1993 NYC, I loved reading about teens and their angst before the age of constant communication. Lucy, the protagonist was a smart, talented basketball player secretly in love with her best friend. And the writing was fantastic. I’ll be reviewing The Falconer later this month. I ended up DNFing Death is Hard Work by Khaled Khalifa after about 40%. There were just too many long bird walks to keep me interested in the core of his story. 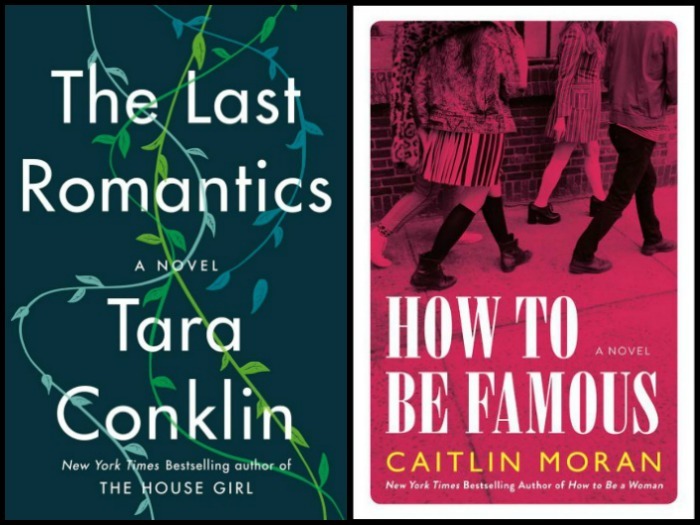 I first started listening to The Last Romantics by Tara Conklin, but quickly realized that there was just going to be too much happening for me to enjoy the book on audio, plus my library hold had come in. To say I’m liking this book is a HUGE understatement. I’m loving it! I really thought I’d finish on Saturday, but a bad chest cold had me doing much more sleeping than I’d expected. I only have about a quarter left, so as soon as I finish writing this post, I’m going to finish, though it’s one of those book where I’ll also be sad to get to the end. I’m really struggling with finding the right audiobook right now. In addition to The Last Romantics, I also very briefly tried The Atlas of Reds and Blues on audio and realized that it was just far too unusual to listen to. Then, I turned to my backlist and started listening to How to be Famous by Caitlin Moran. I really liked her first book, How to Build a Girl, but this one just isn’t doing much for me. I rarely DNF an audiobook, but I think I’m about to on this one. I have lots of February books I still want to read, but Vacuum in the Dark by Jen Beagin is my last ARC for the month. I’m looking forward to this story, billed as laugh-out-loud funny, about a woman who cleans houses for a living. Panic is what school systems do best – hahaha!! I’m planning to read The Falconer…of course my library doesn’t have it, so I’ll be buying it, but not right now. And I’m loving Last Romantics as you know! Hoping to finish it today or tomorrow. Will be interested to hear your thoughts on Vacuum – I have it too, but then realized it was a sequel and I didn’t read the first one! I’m excited to hear your final thoughts on The Last Romantics, especially the very end. I read Jen Beagin’s first: “Pretend I’m Dead.” This is billed as a sequel. While there were a few funny moments, I cringed while doing so. The character is in a bad place with parent issues she (often understandably) can’t get beyond, while self-medicating her mental health issues. Good luck with this one. I hadn’t realized Vacuum in the Dark was a sequel until right before I started it, but it’s working out fine. She’s still not in the greatest place, but her delivery is fun. I should probably read Vacuum in the Dark, since I am procrastinating doing that task right now. 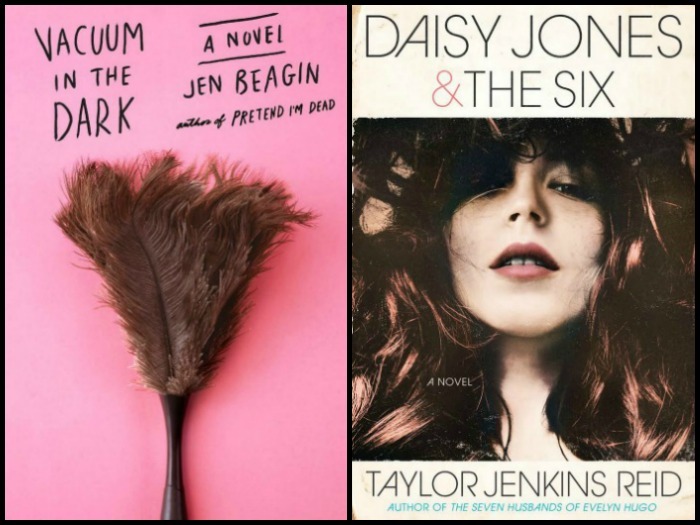 I am currently reading and enjoying Daisy Jones and the Six. Just saw your review of Daisy. So glad you liked it. I have high hopes for The Falconer … maybe I’ll get to it this week. I find it harder to DNF an audiobook than a print book, but sometimes it just has to be done. I agree about quitting on an audio. I can easily do it at the beginning if I realize something about it isn’t working for me on audio, but after an hour or two, I rarely do. Yay! So glad you love The Last Romantics, and that you were able to get ahold of the print version. I have The Falconer coming up in my audio holds soon–I’m hoping it’s good in that format. Interesting that you rarely DNF audiobooks–I actually do it all the time. I listen while working out and it feels weirdly urgent that they grab me and keep me hooked. If they don’t, I stop what I’m doing and go find something new on Libby. Hope you’re feeling better–stay safe on the ice! I LOVED The Last Romantics. On DNFing audiobooks, I have sort of a different standard. If I listen to under an hour and decide it’s not working because of the narration or because the story seems like it would be better in print, I don’t call that a DNF. I feel like it was more of a sample. If I go over an hour, and then decide to quit on it, then I call it a DNF. And, if I got a book on Audible and don’t like it, I always return it. They’re great that way. We are accustomed to and prepared for snow here in Minnesota. That doesn’t mean we don’t have snow days though. Sometimes it is just too much, too fast for the plows to keep up with. BTW it is snowing as I write this but not much is expected today. Tomorrow’s chance is much greater for measurable snow. Lots of good reading time! Come see my week here. Happy reading! Enjoy the extra reading time. I have and we get one more snow day tomorrow. You’re reading so many great books! Well at least I hope they’re great because they’re on my TBR list! I live in the Bay Area so we don’t ever get snow but we had quite a bit of snow on our local hilltops twice this past week! I’m originally from the Bay Area, Sharlene. 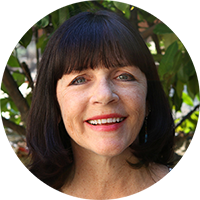 I grew up in San Jose/Los Gatos, but have lived in Washington for the last thirty years. Thanks for stopping by. It was so good, Susan. I know you’ll like it. I hope the snow didn’t cause too many messes. I’ve also been DNFing a lot of books lately. Sometimes I have no attention span, and nothing entertains me. Have a great week! I hate it when book after book doesn’t work, but I think it’s a natural part of being a lover of stories. Hope you find a great one this week. I have about an hour commute to work each way (depending on traffic), so I love listening to audiobooks. I highly recommend The Nix, Washington Black (warning, you will develop a serious narrator crush), The Hate U Give (the movie doesn’t do it justice), The North Water (not a book I would normally pick up, but someone at work recommended it, and I could not stop listening), Rabbit: A Memoir by Patricia Williams (WOW), An Anonymous Girl (which I know you liked as well Suzie). Anyway, just a few suggestions. I am an Audible member but also just recently discovered libro.fm where you buy audiobooks directly through your local bookstore. A great way to support your community! Is The Last Romantics anything like The Nest? (Both are about dysfunctional families, right?) I abandoned The Nest so wasn’t planning to read TLR, but I keep hearing such GOOD things about TLR that now I’m thinking of chancing it! The family is much more likable and relatable than in The Nest. I finished The Nest, but that was about a sort of entitled wealthy family and The Last Romantics was nothing like that. Did you read Commonwealth? It reminds me more of that. (I did a full review on Thursday, if you want to check that out.) It will likely be a top ten book for me this year. Okay, good to know! I haven’t read Commonwealth, either. I’m really curious to hear your thoughts about Daisy Jones! I finished and loved the Last Romantics on vacation last week, my biggest criticism was a slow middle but overall I thought it was great. I adored Daisy Jones and the Six. I loved everything about it. Could not put it down!